The Elder Scrolls VI: Online. The Elder Scrolls has always sold itself on one concept- expansiveness. it is basically a single player MMORPG, a game world for players to fully immerse themselves in for hundreds of hours, without running into the kinds of griefing or subscription fees that are usually associated with MMORPGs. 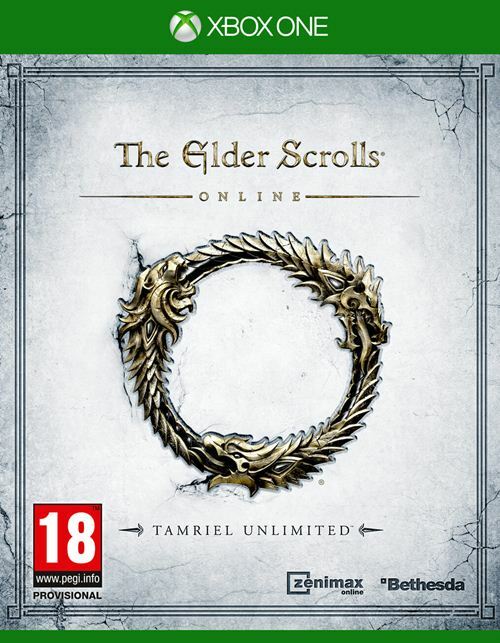 The concept of The Elder Scrolls Online, then, feels like a bit of a misunderstanding on the creators’ part of what it is that makes The Elder Scrolls so successful (the fifth entry, Skyrim, sold over 20 million units worldwide, becoming the highest selling non Pokemon RPG in history in the process)- why would I want to be pay a monthly subscription fee, subject myself to cookie cutter quests that lack even more narrative direction than Elder Scrolls games usually do, and remove some of the best parts of the Elder Scrolls experience, such as mods, from the package, and pay more in the process? Why would I not just stick to Skyrim, or Oblivion, or Morrowind, all extremely accomplished games, and all still highly playable even thousands of hours and many years down the line? Bethesda’s promise is the same as always, but on a much grander scale than ever before- you get a full world, a living world, to immerse yourself in, populated not just by you, but by others as well, all trying to see where the lush landscape takes them. Unlike the numbered Elder Scrolls games, which all restrict you to one part of Tamriel, The Elder Scrolls Online gives you the entire continent.
" It's a promise that the game actually surprisingly follows through on in many regards. In others, it seems to falter a little, often to its own detriment, but in the end, the game comes out as a surprisingly fun experience, even if it represents the weakest mainline entry in the franchise since Daggerfall." The entire world is quite literally your playground, and with so many more, varied locales to discover, the potential for adventures just goes up by that much more. 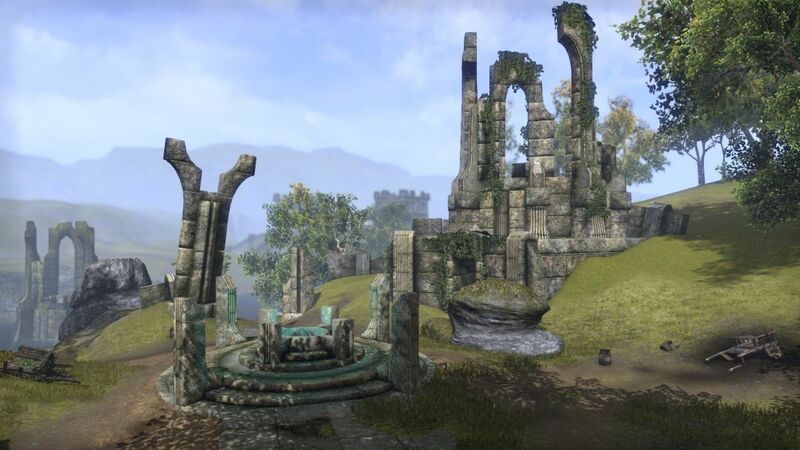 Add in other players, each on their own journeys, with their own motivations, their own adventures, and the potential of them working with you or against you (or both) and the possibility of the stories you can tell in The Elder Scrolls Online- and the Elder Scrolls games have always empowered players to tell their own stories- goes up infinitely. At least, that’s the promise of The Elder Scrolls Online. It’s a promise that the game actually surprisingly follows through on in many regards. In others, it seems to falter a little, often to its own detriment, but in the end, the game comes out as a surprisingly fun experience, even if it represents the weakest mainline entry in the franchise since Daggerfall. The games makes an incredible first impression- after a character creator, that appears to be more or less like the one used in previous Elder Scrolls games (meaning, it’s incredibly granular and allows you to customize some insanely specific details), you’re dropped into the game, which opens with- surprise, surprise it opens with you as a prisoner. 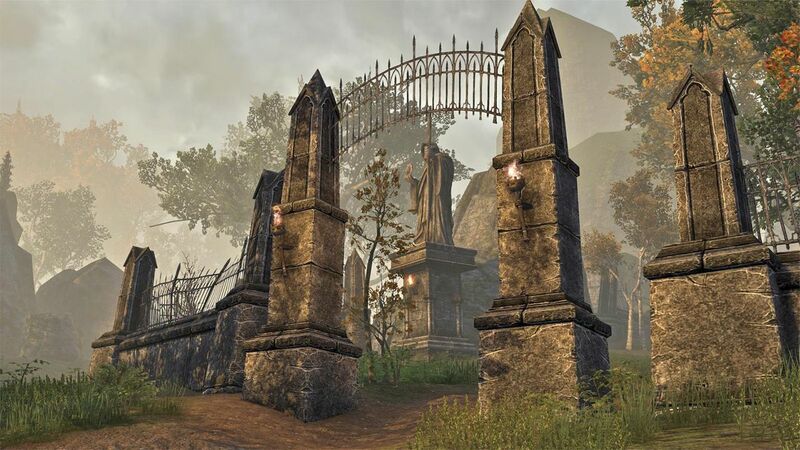 Just as every previous Elder Scrolls game, you’re a captive, and just as every other Elder Scrolls game, your first acts involve you escaping captivity. Specifically, in this case, you discover that you captured and your soul sealed by the deadric lord Molag Bal in the dreary nether-realm of Coldharbour. Your escape sees you dispatch a few grunts, do what basically amounts to some simple fetch quests, get some important plot information, and then you’re dropped into Tamriel, free to go your way. "On the whole, the game does a pretty great job of pulling you in to the world, and making you feel like what you're doing means something." The opening is admittedly distinctly low key- it doesn’t have the tension of Oblivion’s underground escape, nor the epic thrill of Skyrim’s dragon attack, but it instantly immerses you into the game’s lore and world, and raises the stakes to begin with. 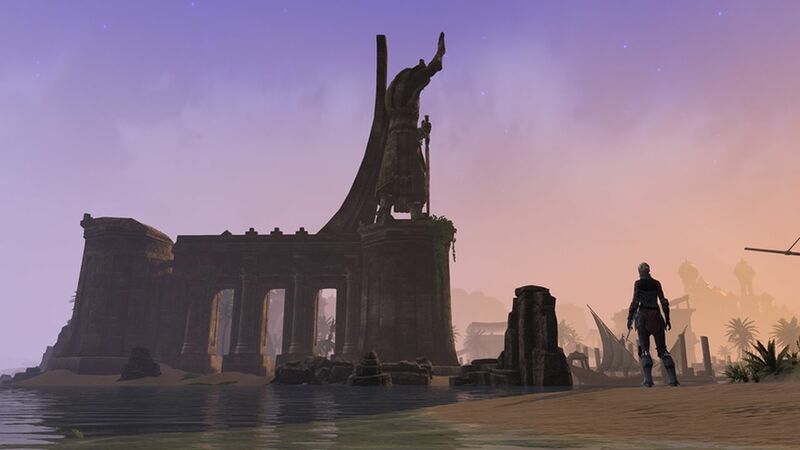 The Elder Scrolls Online acquits itself admirably in its opening section by giving the impression that the player that the game will be narratively driven, and that it will attach context to its quests, sidestepping the MMO genre’s most chronic issue- banal sidequests that feel mind numbingly cookie cutter- entirely. Truthfully, The Elder Scrolls Online delivers on that promise for the most part. Yes, there are still a lot of quests that feel unbearably unimportant and trivial (even near the beginning of the game, right after the intro section, which sets off some ultimately unfounded fears), but on the whole, the game does a pretty great job of pulling you in to the world, and making you feel like what you’re doing means something. It’s not as good as some other games in the genre in this regard- notably, Final Fantasy XIV: A Realm Reborn still bests it (and other MMOs) when it comes to this specifically, and it is definitely a very big step down from previous Elder Scrolls games, but as MMOs go, it does a fairly great job of keeping you engaged. Surprisingly enough, where the game ultimately does falter is in its exploration portions- you’d think that being given unfettered access to all of Tamriel would potentially account for the most epic Elder Scrolls game yet. You’d be very wrong, as The Elder Scrolls Online blocks and gates your progress, and generally keeps you boxed to specific portions of the game until it decides that it is time for you to move on. And while the overall range of the locales you have to visit is certainly varied, within each region, things get repetitive fast, particularly when you have to stay there for dozens of hours at end.
" This leads to a certain kind of dichotomy, where the game ends up being two things- the next Elder Scrolls game, and a big MMORPG." This issue highlights the biggest problem with The Elder Scrolls Online- in making its concessions to being a (really good) MMO, it had to compromise on a lot of its Elder Scrolls-ness. The lack of a true open world that gives players agency to discover as they will really does hurt the game (although the amount of freedom you get generally increases the higher leveled you are, and the farther out into the wilderness you go). The Elder Scrolls Online may compromise on the series’ biggest selling point, but it does make up for it in one other area that the games are generally known to be pretty bad in- combat. Over time, The Elder Scrolls games have tried to make themselves successively more and more accessible, with the result being a combat system that is generally so uninvolved and shallow that most players lose interest in it, treating it as a distraction from the real attraction. Naturally, weak combat would be disastrous in an MMORPG, and it’s nice to see the developers recognizing that, and working to fix it- The Elder Scrolls Online features some fairly deep and interesting combat that builds on the relative strengths of the main series’ combat systems and ideals. This is best reflected in the fact that the combat, at least to begin with, looks, feels, and plays identically to how it did in Skyrim- you have three bars (Health, Mana, and Stamina), and each of them regenerate with time. You use your left mouse button to attack, and your right mouse button to use your shield. But differences soon make themselves apparent- you’re assigned skills (each mapped to a hotkey), all of which are governed by your universal mana meter, and you can use these in conjunction with traditional melee combat, as well as class specific bonuses and perks, using some of the most expansive skill trees that I ever remember seeing in any game, ever. And if that doesn’t present enough options for you, you can still get more, by mixing and matching skill trees (for example, getting afflicted by vampirism opens up the vampire skill tree for you, allowing you to further get a set of skills uniquely customized for your character). As a result, because of how highly each player specializes in their own specific set of skills, you never feel out of place when you go questing with others- it always feels like you have a legitimate role to play, a contribution to make, to the party. "On the whole, it's not a hard game to recommend to anybody- it's a gorgeous looking game, with all the production values the series is known for, some great quests, and deep combat. What it does badly is a sense of community, and perhaps most damningly, the exploration. But like all MMORPGs, it's a work in progress, and it's bound to get better with time." 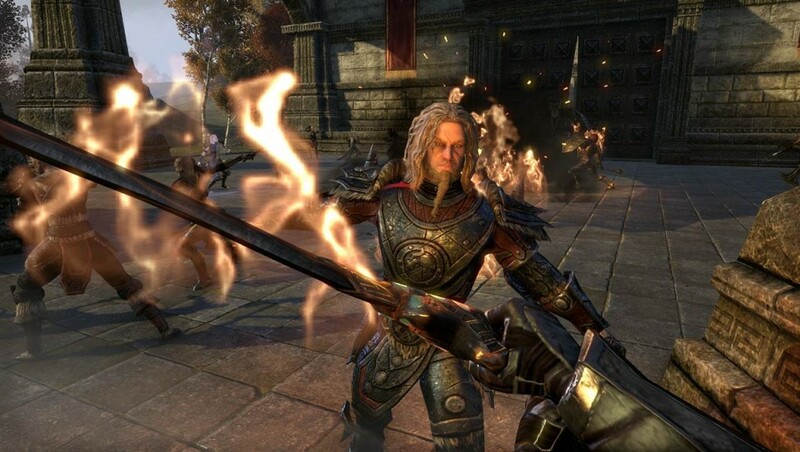 One of the biggest strengths (and biggest false promises) of The Elder Scrolls Online is that it feels and plays almost identical to a regular Elder Scrolls game, with minimal concessions made to its genre. The game controls the same way as Skyrim did on PC (which means, in turn, that the controls are not optimized for a PC experience); the UI is minimalistic and generally stays out of the way until contextually called upon, also like the PC (the only two concessions it makes to MMORPGs are the skill bar, and the chatbox, both of which are so understated they can be easily ignored); everything, from the menus, to the command prompts, to even the dialog boxes, the way the characters move and animate, to how they almost all hilariously sound the same, feels like The Elder Scrolls, and this can falsely give the player the idea that they’re going to get an Elder Scrolls game. It’s not, and when it is, it’s a remarkably poor one. The Elder Scrolls Online, remarkably, succeeds at being an effectual MMORPG far more than being a good Elder Scrolls game. Even as an MMO, it does have some issues- the game’s minimalism with its UI, for example, ensures that a proper sense of community can never be created, particularly in the absence of a persistent text chat. This problem feels even more prominent in later areas, when you venture into high level dungeons alone. At that point, you feel like you’re either playing a very poorly populated MMORPG, or a single player RPG, and that is what The Elder Scrolls Online doesn’t work as. This leads to a certain kind of dichotomy, where the game ends up being two things- the next Elder Scrolls game, and a big MMORPG. This, in turn, further leads to some perception issues- more than MMO fans, who are perhaps loath to pay monthly for a game again, this game will appeal to Elder Scrolls fans. Unfortunately, the game isn’t as good at appealing to the Elder Scrolls fan as it is at appealing to the MMORPG fan, who probably aren’t too big on giving it a chance to begin with. So The Elder Scrolls Online works great as a new MMORPG, but it also represents the weakest adventure series fans have had since the release of Daggerfall, way back in 1996. But on the whole, it’s not a hard game to recommend to anybody- it’s a gorgeous looking game, with all the production values the series is known for, some great quests, and deep combat. What it does badly is a sense of community, and perhaps most damningly, the exploration. But like all MMORPGs, it’s a work in progress, and it’s bound to get better with time. As it stands right now, though? It’s still a great game, and highly recommended to any fans of the genre, or even of The Elder Scrolls series and lore. Just, don’t expect something standard in both cases. Expect something a little different. And different is good. Different is very good. 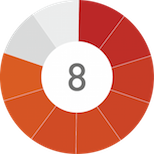 Different indicates a willingness to step outside of the comfort zone. Better at being an MMORPG than an Elder Scrolls game, The Elder Scrolls Online is still highly recommended to genre and series fans, as long as they adjust their expectations going into it.